NASA's Mars Exploration Rover Spirit acquired this image on the 72nd martian day, or sol, of its mission (March 15, 2004) with the left eye of its front hazard-identification camera after digging its wheel into the drift dubbed "Serpent." Creating the commands that would generate this scar was not an easy task for rover controllers. Essentially, they had to choreograph an intricate dance for Spirit, maneuvering it up the side of the dune, shimmying its left front wheel a number of times to create the scuff, and then reversing to attain proper positioning for miniature thermal emission spectrometer observations. 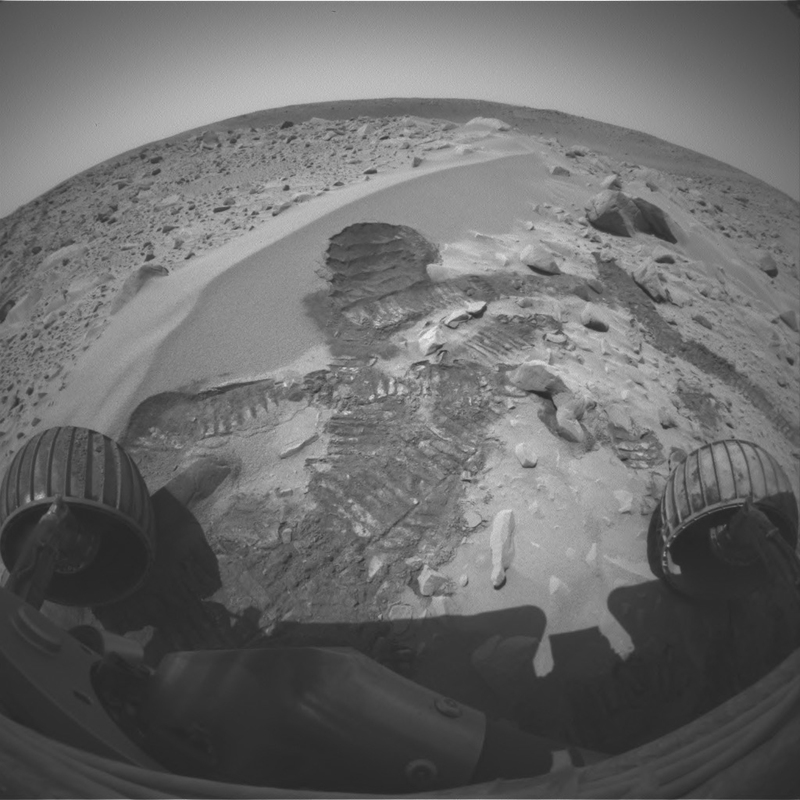 Before the task was finished, Spirit moved forward to put the scuff within proper reach of the rover's arm. This scar allows the rover's instruments to see below the drift surface, to determine the composition of its materials. Initial results indicate that the drift material is similar to the basaltic sands that have been seen throughout Spirit's journey to the large crater dubbed "Bonneville." The material does not seem to be the same as that inside the crater. Two questions raised by these results are: Why is the dark sand in the crater not the same as the dark sand in the drift? And why are there two different dark soil-type deposits in such a small place?